Commissioned by the Greater London Council and unveiled by Oliver Tambo. Plinth reads: "Struggle is my life"
The monument forms part of the Nelson Mandela Museum, a development that also comprises the proposed Nelson Mandela Youth and Heritage Centre at Qunu, a few meters from Mandela's home, and a museum in Mthatha that houses gifts and awards. The 2. 7 m sculpture was the idea of Donald Woods and is placed alongside others of Winston Churchill and Abraham Lincoln. Mr Mandela was present at the unveiling. A nine foot statue by Cape Town sculptor Jean Doyled. 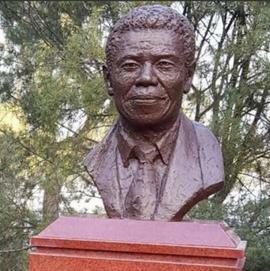 The statue is a copy of the one that stands outside the Drakenstein Correctionsl Facility - formerly Victor Verster Prison.